On January 16, 2015 the National Collegiate Athletics Association, NCAA, restored the 111 wins they had vacated on July 23, 2012 from Pennsylvania State University, Penn State, and their former Head Football Coach Joe Paterno. The NCAA took the vacated wins from the 1999 through 2011 seasons as an imposed punishment, for the child abuse scandal and apparent University cover up involving former long-time Penn State Defensive Coordinator Jerry Sandusky. The Freeh Report, an independent investigation commissioned by the University to investigate the allegations of a cover-up by the former Head Football Coach as well as the University’s former President and Athletic Director among others, revealed that their was significant evidence to suggest that there were inappropriate actions taken to protect the image of the University, the athletic department, and the football program. As dreadfully awful as the entire Jerry Sandusky scandal was to the University, it was abominable to the State College community at-large. The heinous crimes perpetrated by Sandusky against the numerous children over the course of more than three decades were certainly unforgettable if not unforgivable. 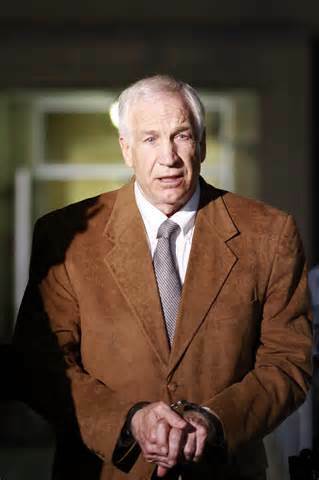 Jerry Sandusky, former Penn State Coach found guilty of 45 counts of Sexual Abuse, and sentenced to a minimum of 30 years in prison. The Commonwealth of Pennsylvania in all of its authority, and through a very thorough investigation of the allegations going back over more than 20 years, performed admirably and enforced the law of the Commonwealth in its jurisdiction. Jerry Sandusky was convicted on 45 counts of sexual abuse and sentenced for a minimum of 30 years in prison up to a maximum of 60 years in prison. However, what was the actual jurisdiction of the NCAA in this case? There were no real charges of NCAA rules violations levied against the university, the athletic department, the football program, or its head coach, Joe Paterno. Yet the NCAA, in all of its wisdom issued sanctions based on the Freeh Report in lieu of its own investigation. It seems as though anytime the NCAA cannot come up with an actual proven violation that the ever popular “Failure to exercise institutional control” clause comes into play. The subsequent penalties, including the vacating of the school’s and Coach Paterno’s victories, were a smack in the face of Coach Paterno as much as or more so than the university. Adding further insult the university even removed a statue of Coach Paterno. The images were not as violent, nor as meaningful, but they had the same spirit as that of the downing of the statue of Saddam Hussein during the liberation of Iraq in Operation Iraqi Freedom. Remove every image of this man and try to pretend he never existed, much less had an impact on the culture or God forbid left a legacy, either positive or negative. I don’t really know the whole story as I suspect most people including those involved do not know. However, I fail to see what all of the sanctions actually had to do with football or the NCAA. I have wept over this awful tragedy perpetrated on the children. It was horrible and senseless. I am appalled that anyone would turn a blind-eye or attempt to cover it up in any way. I am thankful that the authorities courageously performed their sworn duties. I pray for the families of everyone involved and also pray that we never see events like this ever again. I never want to minimize the seriousness of the events and truths of this story. I do think the NCAA should not poke, prod, or meddle in the affairs of the courts. Their doing so in this specific case made it look more like they wanted to wield power they did not possess and needed their share of the publicity. Reform the NCAA or remove them from the leadership position of college athletics.